Looks like they didn't take part to the bath, preferring to have a time for themselves （ ≡▽≡）. It's funny how everybody in this serie can be shown fully naked except for Nanoha and Fate (guess some fans wouldn't appreciate it, at all >.>'). Agreed. Though they might have gain the statute of "icons" even more than "idols" by now. Either way, I'm glad the authors are considerate enough to preserve a bit of their...intimacy d(￣ ￣). Seems that showing Nove,Subaru,Teana and other assets is all right, but still Nanoha and Fate are hands off so they couldn't take the bath with everyone, also Sein being a loli molester, I wonder who taught her that, she rather didn't have any contact with Hayate? It's probably Subaru, IIRC, she had a thing for groping(especially Teana) in StrikerS. Nobody had to teach her, she already did it to Cinque in one StS SoundStage before to leave Jail side. I don't remember Subaru to have this kind of hobby. Though her words alone are enough to embarrass Tea *such a tsundere~*. So Vivio has taught the adult mode transformation to all her friends too?! All the kids have adult mode? Someone posted this pic on /u/. And funny thing is that this new weapon has also close combat mode. Damn I want to see Fate's one too or Vita's. The thing I find terribly funny is that she holds it bare-hands and with polished nails XD. It's just a small detail but it make it looks completely surreal to me. On a more serious note, she sure looks terrifyingly badass. I don't know for what purpose that Strike Cannon has been developed but it must be massive （ﾟДﾟ;).Does the TSAB plan to take down a whole planet? Also waiting to see Vita's Cannon :]. It certainly look badass, but somewhat impractical for a field weapon. Gadgets, its a anti-gadget weapon. Now that AMF and robot techonology is "out there" other people are going to copy it even if Scaglietti is in prison. The number of mages with power levels high enough for them to overpower AMF devices is too small. Plus using power that high is bad for the mages health. So the previously outlawed projectile weapons are being brought back into limited service. As big as this gun is, it would be impossible to be carried on anything other than a vehicle if they hadn't come up with the idea of using a mage as a living power source, instead of having to have a battery or a generator it just has a converter that turns magic into electricity. Also this way the taboo against projectile weapons is only bent not broken since only a magic user can charge and fire the gun, or for that matter levitate it. ViVid chapter 11 Raw is available here. Thanks go to Keroko from AnimeSuki. Thanks a lot Keroko and Nina! Oho, what is this I see on the last page? It seems there may be some fun in the near future. This month, CompAce also presents a cross-over of Prisme Illya& Nanoha. I didn't expected much from this cross-over, but it turn out to be pretty funny and enjoyable. The 4 first pages where Rin summons Fate and Nanoha were too short u_u'. It's good that Saber ask to test their power, but a bit more of fight would have been welcome. Though the last panel was priceless XD. The Prism Illya&Nanoha special was surprisingly better than expected. Illya and Miu have been absorbed in a strange time/space distortion and there meet Nanoha (who save them with her power, 56 times superior to Illya XD), who is in search for Fate. I don't know when this fight is supposed to take place in the Nanoha's time-line, but Nanoha says that Fate is not yet her friend. She nonetheless appears from nowhere to save Nanoha *here insert fangirl scream*, explaining she has tried to take down the origin of the dimensional distortion but didn't managed by herself. Nanoha naturally proposes that everybody join force. After all 4 girls crush Big-Ben and discover that it was actually Rin fighting with whoevershemaybe that created the distortion, Fate returns to her world, soon followed by Nanoha after she received Miu and Illya's encouragements, assuring her that she should not give up at making Fate her friend. Illya reactions at both Nanoha and Fate apparition were hilarious. 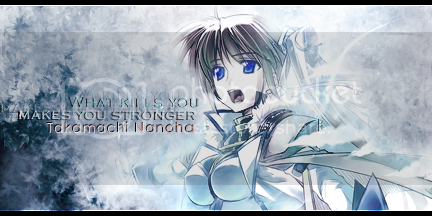 She not only notice Nanoha monstrous power, but also her cuteness. When Fate shows up, she can't even express how cute she is. Truly, MS力 (is there really a pun here or it's just my imagination?（ ≡▽≡）) . Nanoha is quite powerful in the Illya&Nanoha cross-over, almost as destructive as a Macross Cannon, when she annihilate the giant blob-thingy. This cross-over is quite funny overall, I didn't a good opinion of it at first, but I was pleasently surprised by it in the end. Since it's a special chapter, draw by the Prisma Illya artist (Hiroyama Hiroshi), it's true that it gives a "doujin like" feeling. But I'm glad that this chapter is official (without being canon ofc), since we get to see Fate crushing a whole building just to protect Nanoha~. Spoilers for the next Force. The chapter is title "Blood & Flame"
I suddenly want to see Signum fight that girl with the eyepatch and katana really badly. You'll have to wait one month for the next one. Best than the usual 2 months though :]. Well, this is from someone that has already read it, so raws should be released soon if they haven't been already. I hope for decent fight between Signum and that eye-patch woman, that should be nice fight to see, at least we could see what in power levels the new villains are situated, since Signum in her unison mode is most powerfull meele fighter.